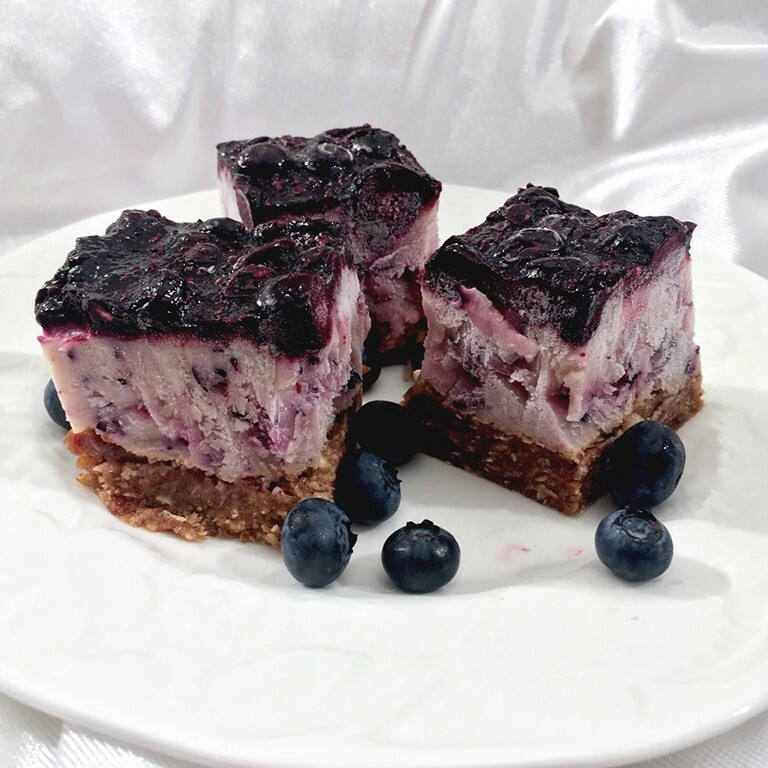 Three of my Top 10 beauty foods make appearances in these blueberry pie frozen yogurt bars. Blueberries are loaded with antioxidants, which help protect against wrinkles and premature aging. Yogurt is high in calcium, which is important for beautiful nails and teeth, and walnuts offer healthy fats, which contribute to smooth skin tone and healthy hair. The bars contain three different layers which all have different textures and flavors. The crust layer has a nuttiness from the walnuts, sweetness and chewiness from the dates, and flavor from the cinnamon and vanilla. The yogurt filling is creamy from the banana and Greek yogurt, with a light blueberry taste from blueberries blended in. (When this layer freezes, it becomes very firm, so it is best to let it defrost for a few minutes). And the blueberry pie topping tastes just like the filling of a blueberry pie! Line a 7×11 inch pan with parchment paper. In a food processor or high-speed blender, blend oats, walnuts, cinnamon, and salt until a coarse meal forms. Add in dates and vanilla and blend until the mixture forms together, almost like a dough. Press this mixture into an even layer at the bottom of the lined pan. In a blender or food processor, combine yogurt, banana, blueberries, maple syrup, and vanilla extract and blend until smooth. Pour this mixture over the crust layer and place in the freezer while you make the next layer. In a small pot, combine blueberries, lemon juice, maple syrup, and cornstarch “slurry”. Bring to a boil and then reduce heat to medium. Simmer until blueberries have cooked and mixture has thickened slightly, about 5-7 minutes. Let cool. Once cooled, spread this mixture over the yogurt layer of the bars. Return to the freezer and freeze overnight, or for at least 6 hours. When ready to serve, let defrost for 5-10 minutes, and then slice into 8 bars.